Coaches often say that one of their biggest challenges is helping soccer players stay committed to their training. Athletes sometimes lose motivation when they hit a plateau. Plateaus in performance sometimes occur when you don’t see any measurable improvement even though you are working hard. “We’re practicing more than ever, but we don’t seem to be scoring any goals,” many athletes say in frustration. Thus, when you don’t see gains in performance, is it difficult for you to stay committed to your training program? What is Commitment in Soccer? Commitment is a type of motivation. It is the ability to stick with a program, method, or philosophy and apply it daily over a long period EVEN in times of adversity. 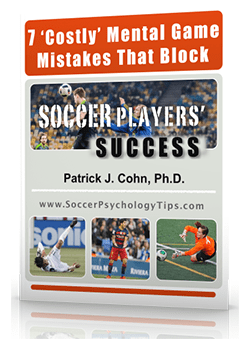 How Do You Stay Committed to Your Practice Plan And Goals in Soccer? The first step to improving commitment is to identify beliefs or distractions that sabotage your motivation. Armed with this information, you are in a position to change your attitude for the better. 1. 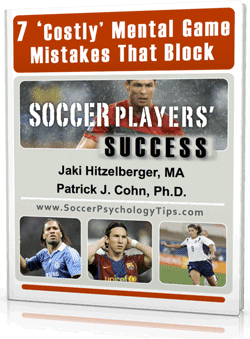 Impatience with improvement: Soccer players often want a quick fix, something that works immediately. If it does not work fast, they are prone to throw it away and not try it again. Example: You want to start going 1v1 more but give up after losing the ball a few times. 2. Fear of trying and not succeeding: Are you afraid of going after your dream and not succeeding? There are no guarantees that if you work harder and put all your energy into getting better your game will improve. But some players can’t stomach the fear of not reaching their goals if they give it their all. Example: You want so badly to make a top level team and freeze up at tryouts because you are focused on the fear of not making it. 3. Over-training Syndrome: Training too much can also cause you to spin your wheels because you are mentally and physically exhausted. Your body needs rest, your mind needs a break. Yes, it is possible to work too much. Example: You play everyday all year round without any recovery time. You are never at top speed and constantly experience nagging injury. The fist step in making positive changes is to identify self-sabotaging beliefs, rationalizations, generalizations, or behaviors that undermine your motivation to be successful. Then you will be ready to change your behavior to increase commitment. In addition to what has already been stated, fear of failure, lack of composure, and low confidence all affect soccer players’ motivation for training. 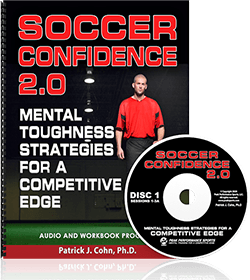 Learn top strategies for mental toughness in soccer and start performing at your peak in practice and games.